This beautiful 101' Hargrave yacht for sale is a proven charter success! : Atlantic Yacht & Ship, Inc. This beautiful 101′ Hargrave yacht for sale is a proven charter success! 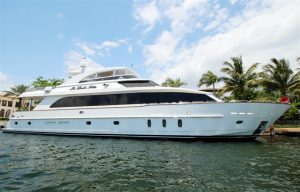 This beautiful used 101′ Hargrave yacht for sale, known as”La Dolce Vita,” is offered for sale by Joe Marino in Florida! In the first place, you will simply love the features on this pre-owned 101′ Hargrave yacht for sale. Additionally, this beautiful used 101′ Hargrave yacht for sale has a proven charter record! Also, the current owner authorized an open checkbook to ensure the highest quality maintenance. One rarely finds a quality yacht offering that has had such pride in ownership. You will love the upgrades and improvements she has seen over her life. Furthermore, she is currently only with her second owner. Equally important, this yacht was delivered new from Hargrave with the utmost attention to detail and professional project management during construction. This used 101′ Hargrave yacht for sale is considered by many to be the most highly admired Hargrave yachts ever built. In addition, her stunning interior with exotic cherry and burl wood accents will impress. Don’t miss the opportunity to inspect this very special motor yacht! For more information on this lovely used 101′ Hargrave yacht for sale in Florida be sure to contact Joe Marino today! For over 56 years Atlantic Yacht & Ship has been serving the yachting community. Our headquarter sales office is dockside at Harbour Towne Marina. That’s in the heart of the yachting capital of the world, Fort Lauderdale, FL. Our in-house waterside service department provides general yacht services. This includes new teak, to engine rebuilds, captain services, and everything in between. Whether purchasing or marketing a quality vessel, Atlantic Yacht and Ship, Inc. is your one stop resource. Turn to AYS for the highest quality service and sales in the yachting industry today. Whether you are looking at yachts for sale, or thinking about selling your yacht. Remember, it is always wise to have an experienced broker representing your interests throughout the deal. Contact Atlantic Yacht & Ship at 954.921.1500 or click here. Price reduced on this beautiful 101′ used Hargrave yacht for sale in Florida! Check out this beautiful Hargrave yacht for sale! Just listed: this beautiful 101′ Hargrave yacht! $25,000 price reduction on this beautiful used 101′ Hargrave yacht for sale!